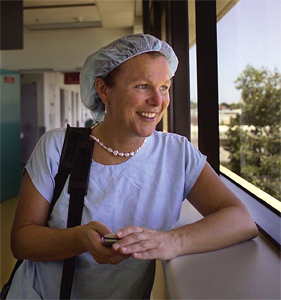 Professor Fiona Wood is a plastic surgeon and Director of Burn Services of Western Australia. She works at Royal Perth Hospital and Princess Margaret Hospital for Children. She is the Chair and co-founder of the McComb Research Foundation, which she established in 1999 along with scientist Marie Stoner. Fiona’s research through the McComb Research Foundation involves collaborative projects dedicated to research and education into burns, trauma and scarless healing. Fiona was awarded the Australian Medical Association “Contribution to Medicine” Award, in 2003 and also received the Order of Australia Medal for work with Bali bombing victims. She was named West Australian of the Year for 2004, and was nominated as a National Living Treasure and Australian Citizen of the Year in 2004. In 2005 she received the honour of being named Australian of the Year. When thinking about the role of medical students in innovation, my mind drifts back to my early days in St Thomas’ Hospital Medical School, London 1975. It was exciting because I could see for the first time that I had a role in the world that was useful. Let’s face it, until then it is pretty well a one-way street, with education being handed to us and us taking it; but here, I could see a chance to grow and to contribute in a way I had not been able to do so. Then came the big question: How? My “research career” started early: I knew that I needed a CV that was interesting to get a sniff of a surgical job, so not all out of pure curiosity. My Bachelor of Medical Science equivalent was both interesting and frustrating, but most importantly, it taught me that I could question. More to the point, that I could work out the strategies to answer the questions. Exploring the evolution of the brain from worms to elephants was fascinating, but did I find the point where the central nervous system (CNS) and peripheral nervous system (PNS) transitioned? No! But I did get to go on an anthropology field trip to Kenya and Tanzania and work collecting fossils on the Leaky camp, which was a huge bonus. So, when I got to my Obstetrics and Gynaecology term, I decided that India was a good place to investigate malnutrition in pregnancy. Looking back, I find it hard to fi gure how I put the trip together with the funding and the equipment. But a long shaggy dog story short, my friend Jenny and I tripped off to a government hospital and measured anthropometric measurements, HbA1c as a measure of carbohydrate metabolism, and RBP, a protein with a high essential amino acid content, to measure the protein metabolism (measured on gel plates by yours truly as I got back). It was a great trip, a huge learning on lots of levels and it still remains with me. Having submitted the work to the British Journal of Nutrition, it was sent back for revisions. However, I didn’t have the understanding to realise that was good and that I just needed to revise and send my changes back. Instead, totally deflated I put it in a file and tried hard to forget that I had failed at the last fence. I clearly was never successful in forgetting! Finishing is key, otherwise you have used resources, yours and others’, and selfishly not added to the body of knowledge. Sounds harsh, but even negatives should be published: How many resources are wasted in repetition? Finishing is essential for all of us. Anyone can start, but learn the value of finishing– I learnt early and it is with me still. Regarding tissue expansion, it was said casually by my consultant that, “It’s all well and good to create skin with characteristics similar to the defect, but the nerves are static and so the quality of innervation will decrease as the skin is expanded.” Really? I wasn’t so sure. So, off to find a friendly neurophysiologist who helped me design an experiment, and taught me how to do single axon recordings on T11 of a rodent model. We proved for the first time that the peripheral nerve field was not static but responded to the changes in the skin with forces applied. We are now familiar with neural plasticity. Understanding CNS and PNS plasticity remains a corner stone of my research efforts exploring the role in healing the skin. How do we harness the capacity to self organise back to our skin shape, not scar shape, on a microscopic level? How can we think ourselves whole? Questions that stretch and challenge us are always the best ones! The spray on skin cell story for me started in 1985 in Queen Victoria Hospital, East Grinstead, when I saw scientists growing skin cells. Another wow moment. So, I read all I could get my hands on. That is the starting point, to know what is out there. There is no point in reinventing the wheel! In 1990, as a Registrar in Perth, with the help of the team in Monash, Professor John Masterton and Joanne Paddle, our first patient was treated in Western Australia. By 1993, Marie Stoner and I had a lab in Perth funded by Telethon, exploring the time taken to expand the number of a patient’s skin cells to heal the wounds as rapidly as possible. By 1995, we were delivering in a spray instead of sheets. We then developed a kit to harvest cells for bedside use, using the wound as the tissue culture environment. This is now in clinical trials around the world, some funded by the US Armed Forces Institute of Regenerative Medicine. That is another lesson: The work never stops, it simply evolves. So, asking questions is the starting point. Then, finding out how to answer the question, who can help support, do some work, fund it, etc., are all valid questions. BUT you must also ask, what direction do you go when there are so many questions? Go in the direction that interests you. Follow your passion. Not got one? Then expose yourself to clinical problems until you meet a patient you want to help like no other, in a subject area that gets you out of bed in the morning. Then, you will finish, maybe not with the answer, but with a contribution to the body of knowledge such that we all benefit. Do medical students have a role? A group of highly competitive intellectual problem-solvers? Absolutely, if they choose to. I would say start now, link with positive energy, keep your ears and eyes open, and always learn from today to make sure tomorrow is better, and that we pass on medical knowledge and systems we are proud of.